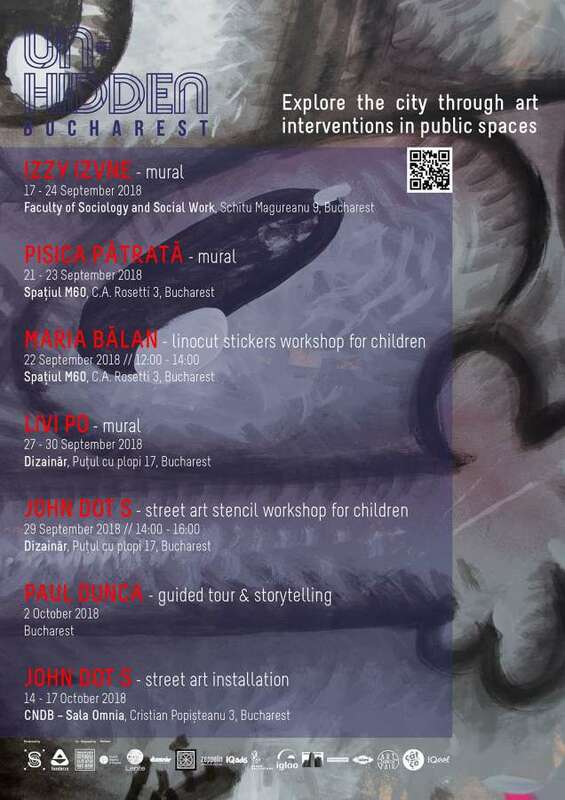 The 2nd edition of street art project Un-hidden Bucharest continues with a new street art intervention by Livi Po, a street art workshop for children with John Dot S., the photo contest organized on Instagram and the two guided tours that we invite you to attend. Soon Livi Po will draw one of Dizainar‘s facades. On Saturday, 29 of September, the street art workshop takes place at Dizainar, where children will learn from John Dot S. to make a stencil. After an intense week of work, with over 70 hours of drawing together, iZZY iZVNE and Bboy Vean have done a great deal of wall painting in which you can lose in six different worlds, portals to light and dark that coexist in balance. On the 6 spirals embedded in the blind wall cartridges you can decipher the poems “Rondelul cariatidelor” by Ancuța Clim, “Ctrl+S” by Alexandra M. Păun and “Replici dintr-un film distrus” by Vasile Leac, written during the Open Call POEM CAPITOL. Recently, Pisica Pătrată has carefully crammed a lot of fluffy and writing characters in a tense scene where they watch you with stunning looks. Also in the Un-hidden Bucharest project, we‘ve explored with Maria Bălan art as a means of urban regeneration with the help of a street art workshop for children, meant to stimulate the interest and involvement in the life of the city.